Keeping your Equines healthy from the inside out. Wendy is a qualified Iridologist and Herbalist and 100% Natural Equine was founded by Wendy in 2010 when no other products on the market were effective on her own horses. Researching natural plants and oils ability to repell insects in Australia, led to the development of purely natural equine and canine products. Using only 100% pure oils, extracted by water distillation from the buds and leaves and by steam distillation from the stalks and stems of plants such as Eugenia Caryophyllus Bud (clove bud), Eucalyptus Citriodora, Lavandin Grosso, Cympogon Nardus (citronella) ensure our products remain 100% natural. The creation of all the herbal supplements use highly graded herbs sourced from their native areas from all over the world, ensuring that they are effective in the support of many ailments including ulcers, liver and kidney disorders, head shaking, lameness and many other equine and canine issues. Wendy also offers a Bespoke Herbal Mix made specifically for individual animals which can be discussed directly. Being able to target many issues in one tub means you can avoid having to purchase lots of different products. Continuing to have a hands on approach in all production and distribution of products, from the lovely market town of Coggeshall, Wendy ensures that the original quality and standards remain. Having had an equine background and veterinary experience for most of her life, she knows the importance of good quality natural products both in and out of the house and tack room. Wendy is delighted to now offer her Equine Iridology consultations. Having spent time studying the subject in the UK and in France with the outstanding guidance of Equine Iridologist Ellen Collinson, she has a growing number of clients who value the insight into long standing problems that owners just couldn't put their finger on the cause, and with the help of Wendy's 100% Natural Equine Herbal Products, Wendy is able to offer herbal advice while attending all iridology visits. If you are interested in having a consultation by either email or yard visit then please contact Wendy direct to organise. 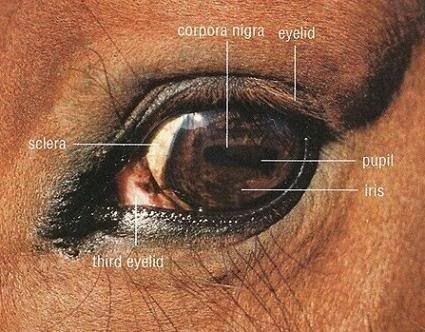 They say you can tell a lot from the eye and in the case of Iridology it is literally the insight to your horses past, present and future health issues. We are not veterinarians or doctors. The information on this site is based on the traditional and historic use of herbs as well as personal experience and is provided for general reference and educational purposes only. It is not intended to diagnose, prescribe or promote any direct or implied health claims. This information is and products are not intended to replace professional veterinary and/or medical advice. You should not use this information to diagnose or treat any health problems or illnesses without consulting your vet and/or doctor. We present the products on this site and the information supplied here without guarantees, and we disclaim all liability in connection with the use of these products and/or information. Any person making the decision to act upon this information is responsible for investigating and understanding the effects of their own actions.